We're still getting in firewood for the winter. Monday afternoon Don and I went back to the slash pile in order to pull out more logs and cut them up. Unfortunately we've had a bit of rain since the last time we were there, and it was a lot more dicey to get down the steep skid road to the slash pile. It also meant the landing where the tractor worked, pulling out logs, was a churned-up muddy pit. We pulled both the tractor and the truck down to the slash pile. We unloaded the equipment we needed from the truck (chainsaw, crow bar, gasoline, etc.) then drove the truck back up to the road. We didn't dare risk loading the truck with firewood lest it be unable to get back up. The skid road doesn't look like much of a problem in these photos, but I assure you it was. We yarded a bunch of logs but then had to stop because the tractor could no longer get any traction in the mud pit. Then we realized we had a problem. We could cut the wood up, yes, but then what? How would we get the log pieces up to the road and loaded into the truck? It was too muddy to bring the truck down, we didn't have enough chain to chain the logs and drag them up the skid road, and we couldn't load much in the tractor because frankly we weren't all too sure our two-wheel-drive tractor could even make it back up the road once, much less multiple times. Arrrggghh! ...and heave the wood pieces up this embankment. It's a short (about 30 feet) span up the embankment to the road. We could chain the logs and drag them up the embankment to the road, but that would damage the embankment and it's not our property. Instead, we'll form a human chain later on with some neighbor kids and get the wood up to the road, and then load it in the truck. ...I heaved the log pieces up the embankment. Then we had to stop because it was starting to rain pretty hard. We knew a storm was coming in and had wanted to get some wood cut before the skid road got even muddier. Well, storm it did. The wind kicked up, and the rain poured, and it was miserable. I shut Matilda and her calf Pearly into Matilda's stall (these two are lowest on the totem pole in the herd and would be pushed out of the barn otherwise) and we battened down hatches. Around 9 pm our power went out - no surprise there - and we read by lamplight for awhile before all going to bed. All night long the wind shrieked and moaned and whistled. By morning the power was back on. Don left early with our friend to bring back her wood cookstove. An hour or so later, I looked out the window and realized that all the livestock - every single critter - was out in the driveway. Grrr, how did that happen? Turns out the wind was so strong, and it came on the heels of earlier rains which had softened the ground, that gateposts became loose and gates were getting pushed open. I found three gates wide open, and our heavy metal driveway gate had blown closed. I closed the gates and tied them, just to be safe. The girls and I tried to get the critters back to where they belonged, but they weren't cooperating and we didn't have a lot of time to mess with them (we were on our way out the door to go into the city). With the driveway gate shut, there wasn't a whole lot of places they could go, so we left them munching on old hay bales and left. The power went out just before leaving. We were expecting UPS to pick up a package. Since no one would be home - a rarity - I left a sign for the UPS driver. We didn't want another repeat of last summer's open-gate experience. We hadn't realized just how bad this storm was. Turns out our power was out because a line had come down nearby, and the poor hard-working electric company men were repairing it. I stopped and spoke with them and they said the whole substation was out. These poor guys had been up all night fixing lines, as you can imagine. I wished I'd had some warm chocolate chip cookies to give them or something. People like this are some of society's unsung heroes. In addition to the usual blown-down trees and branches, we saw signage tossed around like paper. Apparently the strength of this storm caught a lot of people by surprise. We live in a high-wind area, and wind is no big deal. The fact that this one did as much damage as it did was unexpected. 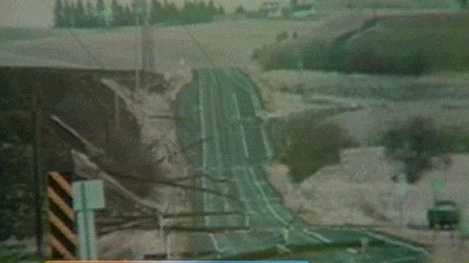 South of us, eleven power poles came down domino-style across the highway. I don't know how high the wind got here, but down in Orofino it was clocked at 87 mph. Yikes. Your mushroom looks like angel wings, which are relatives of the oyster mushroom. Angel wings are a bright white color. They like to grow on old rotted conifers. Sometimes they have fluted edges, sometimes they appear feathery, and they can grow either flat or curved. They've been listed as edible, but recently several deaths have been attributed to them in Japan. Glad to see you came out fairly well. That's hurricane force winds here in Florida. I hope it doesn't cause to much more interruption in your slash pile wood gathering. I'll pray for good weather and dry ground. Wow!...and sometimes we think we are the only ones who have one mishap after another. Patrice, thank you for thinking of the electric utility workers as "unsung heroes." Most people take electricity for granted until the power goes out, then they moan and complain to anybody wearing a hard hat. I worked for 20 years as a clerk for a major utility company and I can confirm that those men and women work very hard and in very dangerous situations before, during, and after storms so that the power gets to the people. It's so very good of you to think of those workers in appreciative terms instead of the terms they usually get thrown their direction. Thank you. As for the havoc the storm rained down on your plans, that is one reason we all prepare. We just never know what will happen with the weather or with the ground upon which we stand, so being prepared for just about anything is the wise way to live. You and your family exemplify that wisdom. Were the gateposts set in concrete? If not, something else for your list of things to do next summer. I fear it's going to be a rough winter, so this may only be the prelude. Wow. I feel like an idiot, because that's about all I can think of to say!!! Impressive storm, and impressive people for doing what you do to get through it. This must be the same storm that raised cain in Seattle a few days ago. Sorry to hear how difficult this has made things for you. After reading how this went down. I think you made the right moves to make the best of a bad situation. my oh my patrice...you have had quite some adventures the last few days...i know all about how muddy and slick those old roads can get. kids would get so much mud on their boots trying to get up the road to catch schoolbus that we had to put a big metal box next to the mailbox so they could leave the boots before getting on the bus. i have been known to gain twenty pounds just by getting in the mud. and losing twenty pounds when shedding the boots. Patrice and Don are wonderful examples of Americans who work hard and go to great extremes to prepare. There is not one lazy bone in their body! Instead of Patrice going into town to get her nails done, she's been hauling firewood. She could have claimed that was not part of her job description when she said her wedding vows, but she is a team player. (What we don't see is her cracking the whip and keeping everyone working as hard as she does). For anyone who is interested in food storage, Glenn Beck said he will be speaking on this tomorrow on his TV show (4 pm central) in front of a live studio audience...an audience that does not have their head in the sand. If you don't have a TV, might want to find one. Food storage and stockpiling...should be good! We also had a small storm last night, enough to wake up my eight year-old daughter and launch her into our bed, and also enough to cause sporadic power outages. The power was back on as I left for work at 5:30a, but soon went out again as my wife tried to get our two youngest out the door to meet their school bus. And here's where I learned a lesson. It is still very dark this time of year as the kids are getting ready for school, and with the power out this morning my wife had to go get one of my new Kirkman #2 kerosene lanterns out of the garage. But... I never trained her how to light it and use it properly (opening the chimney, adjusting wick height, etc). Now, like me she's also an engineer so she figured it out pretty quickly, but she had to do this in the dark by flashlight under time pressure to get the kids ready. Not good, because "When Momma ain't happy, ain't nobody happy." So I now need to review all the items I've bought recently and learned how to use myself, and teach the rest of my family how to use them, too. Duh... In hindsight this is blindingly obvious I suppose, but somehow in the hustle and bustle of everyday life it just slipped my mind. Thank goodness for these "minor" emergencies that help us prepare for the bigger ones. To echo what StCJ said, Glenn Beck's show tomorrow should be interesting for all of us who are interested in longterm food storage. His show airs twice a day on the Fox News Channel. If you're just starting out with longterm food storage, his show on Thursday, November 18, 2010, may be very helpful for you. Not only is Glenn Beck a member of the LDS (Mormon) church, he is also a firm believer in trusting in yourself for your wellbeing rather than trusting in the government. I'm sure grateful for all the good souls who meet up here and share good words, thoughts, useful advice and prayers. Thanks to Don and Patrice for affording us all the forum and the privilege of using it. ......And Patrice, you better not be out there schlepping logs and fixin' fence in your new Prada pumps. As for the logs, would a wheelbarrow be better than a human chain? You could still have all the people there and they could take turns pushing it. I experienced my first earthquake a couple of days ago. In Nebraska of all places! Out here where the ground is solid, quakes take a few minutes to spread out. It was wacky. People who know me well think this is a phoney story. The little building I was in started making sounds out of the strangest places. Cabinets, the roof and the electrical conduit pipes were all making sounds that defie desciption. Kind of like rats scurrying through the walls. Good ear, Anonymous 6:36! That's a very good way to pick up on an earthquake BEFORE things go to shakin' and rollin.' Speaking from experience, it can make the difference in surviving a quake unharmed or getting hammered. It only takes a split second to get thrown to the ground and/or getting buried. Glad you were unhurt. Nebraska??? Makes me wonder about the New Madrid or worse yet Yellowstone. Woo. Big doin's. I don't wait for the shake...if the 'house starts talkin'" I get gone real quick.